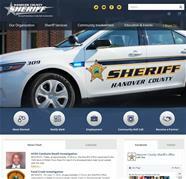 Hanover, VA - The Sheriff’s Office is excited to announce our newly designed website at www.hanoversheriff.com. Our new website has been designed to provide accurate, up to date information, while being user friendly and easy to navigate to meet the needs of our citizens when they are looking to learn more about the Sheriff’s Office. • News Flash – Find important news and information from the Sheriff’s Office. • Calendar – Access our calendar and see what events we will be participating in throughout the county. • Notify Me – Sign up to receive messages via email or text when we send out a news release or when we add events to our calendar. • Become a Partner – Explore the many ways you can partner with the Sheriff’s Office to build strong, safe communities. We hope you enjoy exploring our new website and learning more about your Sheriff’s Office.